The most usual pattern of Aboriginal warfare was either a ‘payback’ punitive expedition targeting a specific individual, or otherwise a raid to steal (or bring back) particular women. For such excursions, a small party of usually 3-7 men made a secret journey deep into enemy territory, conducted their killing or raid in a surprise ambush, and swiftly returned. Sometimes the ‘avenging party’ was supported indirectly by a much larger body of warriors. Targeted killing of whites (e.g. outstation shepherds) seem to have evolved from this practice. Less often but very spectacular were inter-tribal tournaments. These were highly formal arrangements involving several tribes – many hundreds to thousands of participants. Often the entire group would camp at designated places and the battles were held on an open flat between the camps. The cause was often a grievance over trespassing and infringement of hunting rights. Combatants would form lines, with novices being allowed to fight before the senior warriors, who would file out very formally as the fight livened up. These seasoned warriors (and champion warriors) eventually engaged in one-on-one fights with their opponents as the battle continued. At this point, women also engaged in one-on-one fights, usually with yam sticks. A battle in such cases was ‘won’ by one of the parties drawing blood or otherwise by driving the opposition off the field and onto the ridges where the camps were. In most cases, if anyone was wounded or killed, the battle ended, although fighting might be re-started several times after each set of casualties were tended to. Overall, casualties were reportedly few and most of the ‘battle’ consisted of venting grievances, bluff and intimidation (displays of aggression) or skilfully dodging the spears and other weapons of the opponent. Pitched battles of warriors with settlers and police seem to have evolved from inter-tribal tournaments, but as these could result in tremendous loss of life for the Aboriginal participants due to the superior power of gunfire, they were resorted to rather intermittently – for example, if a large party or camp was directly attacked. The basic weapon of SE Queensland warriors was the spear. A warrior carried a number of these into a fight, and also relied on spears tossed by the enemy. Some spears were extremely long and strong, and could be hurled great distances. Boomerangs and clubs were also used in fighting. Some clubs were fashioned to be thrown from a distance. Tomahawks and knives (originally of stone) were used in close-range fighting, though there are reports of tomahawks being thrown. In post-contact times, steel tomahawks obtained by trade, and knives fashioned from broken bottle glass or old shears were preferred. It also became common to attach horseshoe nails to the heads of clubs to improve their lethal capacity. Figure 7: Throwing clubs. These could be hurled from a distance as weapons. 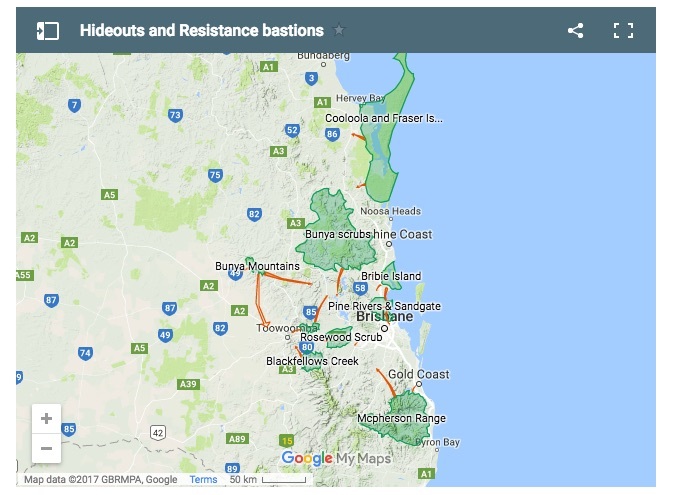 In much of Australia, resistance occurred on a group-by-group basis, steadily moving across the continent. Nevertheless, early sources record warriors from one Aboriginal group at times combining with one or even a few other Aboriginal groups in a concerted effort. Traditionally, many parts of Australia had groups that at times conducted ceremonies, tournaments, hunting drives and other activities together. 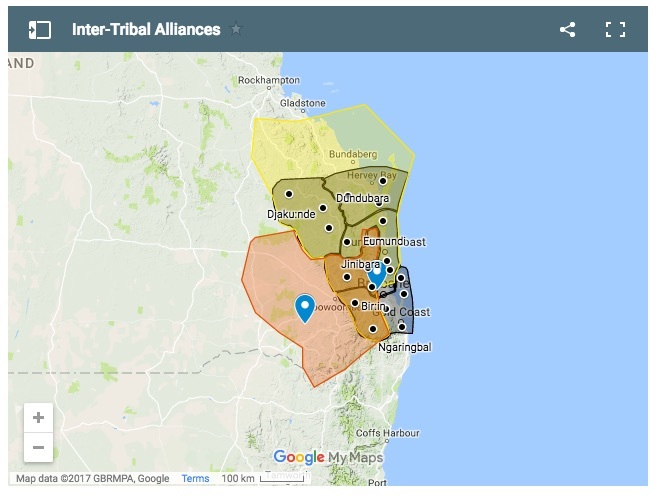 Willie MacKenzie (a Kilcoy elder) recalled that the many groups of south-eastern Queensland formed five large tribal alliances, who came together especially during staged fights (inter-tribal tournaments), although their partnerships shifted from time to time. The alliances and their inter-tribal activities probably explain the reports of “hundreds of warriors” attacking runs. 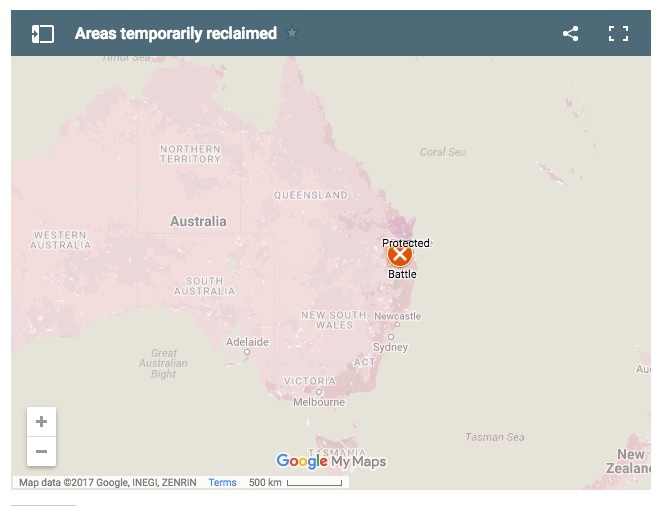 As the feature map shows, the Kilcoy massacre of 1842 riveted many of the usually-feuding groups into combined actions against settlement. 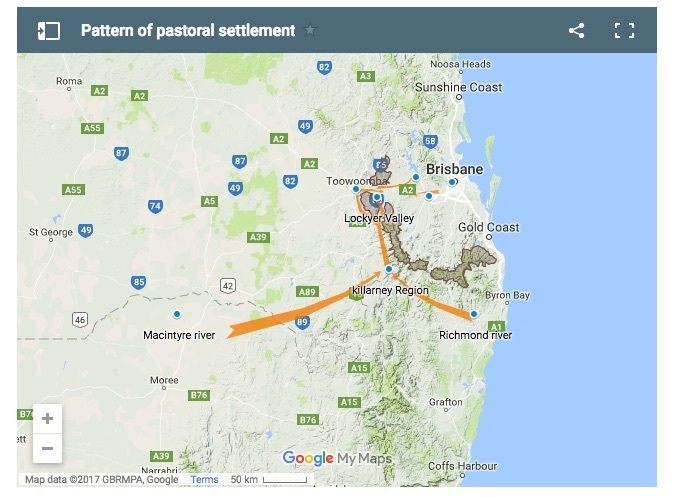 On the basis of reports from escaped convicts and missionaries, the Lands Commissioner Dr Simpson reported to the NSW Governor that some 14 tribal groups had together declared enmity against white settlement. It is not clear how long this combined effort continued. However, some (on Moreton Bay and south of Brisbane) had already had their battles during the 1830s and had reached agreements of some sort with the settlement. It also seems that different groups fell away from these combined efforts quite quickly on account of the horrific retaliation against their people. Darragh T A & Roderick J Fensham (eds) (2013), The Leichhardt diaries – Early Travels in Australia during 1842-1844, Memoirs of the Queensland Museum Culture Vol 7 (1) Brisbane 2013, 30 July 1843, p. 266.